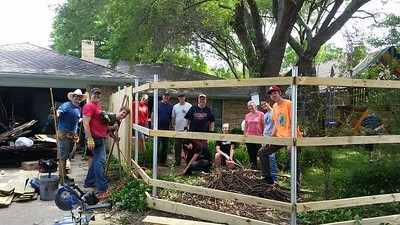 Change the World Allen exists to inspire, equip, and mobilize members of the Allen-Fairview-Lucas community to serve our neighbors and change the world in positive ways. We mobilize volunteers and increase civic engagement to build a stronger and more resilient community. During the weekend of May 17-19, 2019 the hotline will be available for project leaders to reach the CTW Admin team. Mark your calendars. Change the World weekend returns to Allen May 17-19, 2019. You are invited to join the Change the World Weekend event on May 17-19, 2019. Change the World is an organization dedicated to transforming our local community through acts of service and opportunities to build relationships with our neighbors. 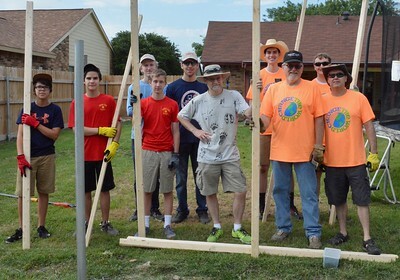 Over one weekend every spring, volunteers from many community organizations will form work teams to help local residents by doing general exterior home repair, fence repair and yard work. Choose from a variety of community-wide projects that will be added to this site over the next few months. Change The World Weekend offers children, teens, and adults the opportunity to pay it forward right here in their home community with a variety of projects that serve others who are hungry, in need of clothing, seeking safe shelter, and longing for comfort. Currently we are identifying volunteer opportunities, in these functional areas. Homeowners will be selected based on need and availability of volunteers. Homes selected to be repaired will NOT be responsible for supplying equipment, food, or drink to the team working on their home. Our volunteers will provide all necessary supplies. We do encourage homeowners to participate in the project if they are able. If you, or someone you know, are in need of assistance please submit a Project Request Form. All requests must be submitted by March 15, 2019. The application for project requests is closed for 2019. Please check back in early 2020 for next year. Complete the downloaded form and use one of the methods below to submit the form. CLICK HERE to upload the file(s). Committee work is underway identifying projects, organizing logistics, and preparing communications. Now we need project leaders to help make these projects happen. Help make it happen by volunteering as a project leader TODAY. Click the button below for more information on being a project leader. You may also contact Jessica Wright at 972-727-8261 or jessicaw@fumcallen.org. Community Partnerships – Maximizing our collective talents and resources to create sustainable change. Civic Engagement – Embodying the power of each person taking action to change the world for the better through meaningful volunteer service. Respect and Inclusion – Serving together builds bridges between neighbors and creates a platform for mutual understanding and respect. Pursuit of Excellence – Doing our best at every level and continuously improving in everything we do.